Our newest book was released September 21, 2016. A Peace of My Mind: American Stories has been awarded first place in the Beverly Hills Book Awards for Multicultural Non-Fiction and runner-up for Photography / Art for the New England Book Festival. 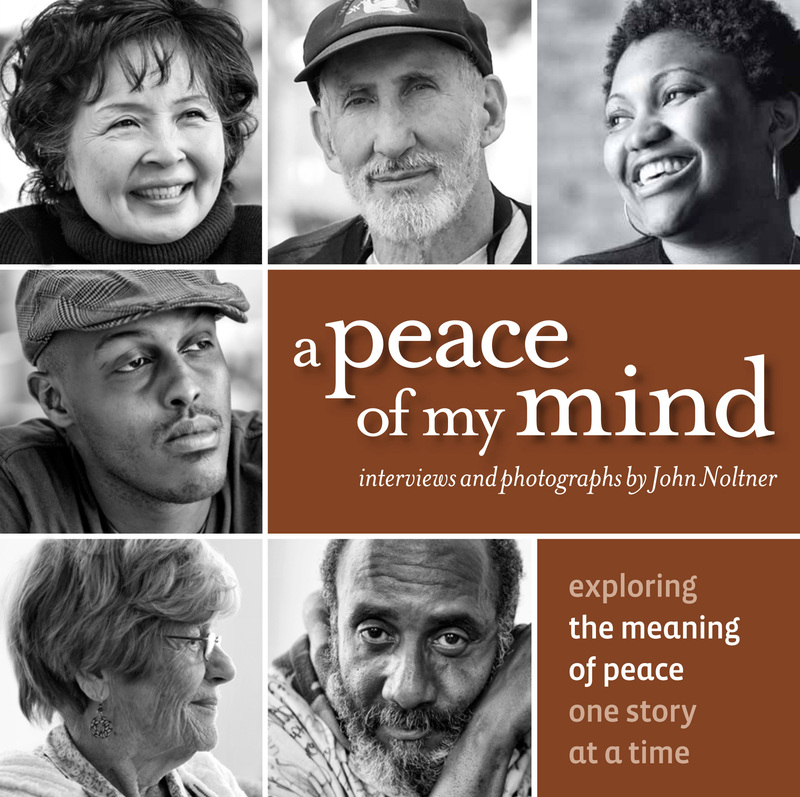 This inspiring collection is the result of photographer John Noltner’s 40,000 mile journey across our country, asking the simple question, “What does peace mean to you?” 58 people from diverse backgrounds share stories of hope, redemption, and forgiveness, paired with compelling color portraits in this 144-page, full color book with a foreword by Terri Lee Freeman, president of the National Civil Rights Museum. Designed to encourage thoughtful dialog, A Peace of My Mind: American Stories includes a series of simple discussion questions in the back for book clubs and small groups. Many of the questions included are the same ones used to conduct the interviews presented in the book. A map of the journey, an artist’s message and stunning scenic images from the American landscape complete this second book in the series. Single copies of the book are available here. Discounts for multiple copies and wholesale orders for retail outlets can be arranged directly with the author through our contact page. Our original book is in its third printing. In 2012 the book was awarded first place in the Midwest Book Awards, and a silver IPPY from the Independent Publishers Association. The stories in this 120-page soft-cover book are drawn from the podcast interviews for A Peace of My Mind. Each person in the collection is showcased with a beautifully reproduced, full-page black and white portrait. On the facing page, a brief biography and a 250-word passage from their interview reveals the thoughts and insights of each individual. The book is integrated with online content so that if a story intrigues a reader, they can go to the original podcast on apeaceofmymind.net to hear a more in depth conversation with each subject. Ela Gandhi, granddaughter of Mohatma Gandhi and active in resisting South Africa’s Apartheid, wrote the foreword for the book. An artist statement by photographer, author, and project founder John Noltner is included as well. Well-suited for book clubs and classrooms, A Peace of My Mind includes a series of simple discussion questions in the back of the book designed to foster dialogue among small groups. Many of the questions included are the same ones used to conduct the interviews presented in the book. A resource guide is also incorporated into the final pages of the book, giving readers access to many local and national organizations that work, in diverse ways, toward greater peace in the world.